INJECT is a new digital toolkit for journalists, it can be used to quickly and efficiently build news stories, gather data and find verifying sources without changing tabs or leaving the document. To automatically expand the story further with additional content after publishing and ultimately produce better news stories, faster. INJECT combines smart creative search algorithms and interactive features to discover, manipulate and present news content. The algorithms and features help journalists to discover new story angles, then use these angles to work faster. INJECT has been developed by an EU-funded consortium of leading digital and journalism organisations who came together to deliver a step change in newsroom tools. The consortium launched INJECT at #Cass Innovate 2017. Information now flows through our lives 24/7, but how much of it is unreliable? More than ever, Reporters must select, verify and account for their facts. INJECT goes beyond conventional search engines. It makes creative search techniques and explanatory background fast and easy to use for enriched reporting. 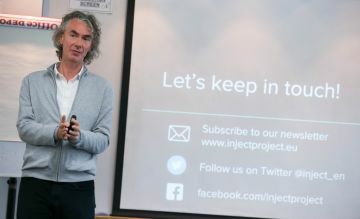 You can read about our launch on journalism.co.uk "INJECT allows reporters to uncover new angles, key figures and sources for their stories by searching through their organisation's archive or across the internet." This is the first tool that seeks to integrate productivity and creativity support directly into the digital work of journalists. It builds on successes in other domains to deliver key innovations in journalism.